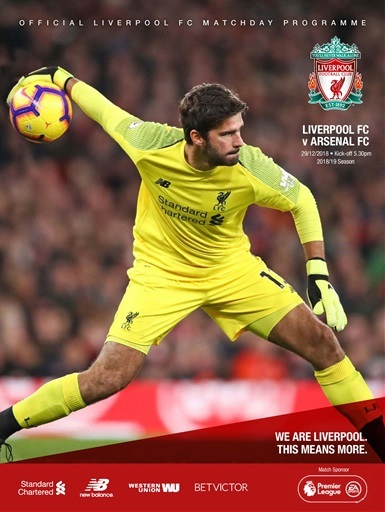 With seven wins from seven so far in December the Reds will be looking to round off 2018 in style against Arsenal. Both Jürgen Klopp, in his manager's notes, and Andy Robertson in an exclusive interview share their appreciation for an Anfield crowd that they will need again today to aid them in their pursuit of another three points. Former Gunner, Alex Oxlade-Chamberlain, is the main topic of Jordan Henderson's skipper's notes as he praises the midfielders attitude and determination upon his return to light outdoor training following his knee injury. Elsewhere we look back at the titanic matches between these two sides when they were the country's best two teams in the late Eighties in The Big Read, while there's Dejan Lovren's photo album and a Q&A with Fabinho. The Liverpool v Arsenal official matchday programme is on sale now.